YEREVAN. 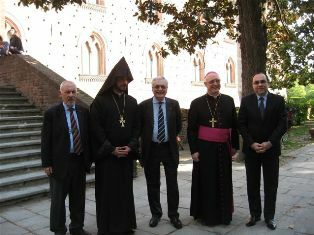 – Armenia’s Ambassador to Italy, Ruben Karapetyan, visited the City of Pavia on Wednesday to attend the official opening of an Armenian cross-stone, at the city’s 14th Century Castello Visconteo Castle, to mark the Victory Day against fascism during the Great Patriotic War in World War II, and 20th anniversaries of the liberation of the Nagorno-Karabakh Republic’s (NKR) City of Shushi and formation of the NKR Defense Army. The event brought together Pavia’s municipal authorities, public representatives, and members from the Italian-Armenian community. Pavia’s Mayor Alessandro Cattaneo and Ambassador Karapetyan delivered opening remarks. The cross-stone is a gift to Pavia from the Municipality of its sister Armenian city, Gyumri.